Bijlmer Euro Shops this takes you to a bigger map where you can see the shops properly. You can also click on the blue markers to get some more information about the shops. 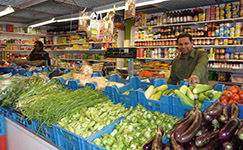 A few years ago Mr Badri took over the fruits and vegetables shop at Bijlmerplein. He decided he was going to sell more tropical and exotic products than the previous owner. In Mr Badri’s opinion it´s very important to respond to the needs of the members of the Bijlmer community. In February 2010 Mr Badri became the new chairman of the Amsterdam Poort merchants’ association, because he wants to contribute to the innovation of the shopping centre and highlight the positive position of Amsterdamse Poort as a multicultural centre. 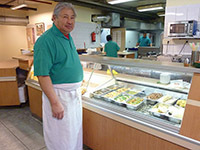 Since 2005 Mohammed Atouli runs the fishmonger´s in Kraaiennest. Although the future of the shopping centre didn´t look bright at the time, he decided to take the risk and take over the shop from his then employer. 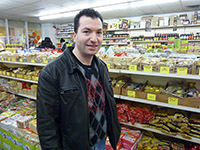 In 2009 he acquired another shop, Tropical Food, also in Kraaiennest. Mohammed is what you call a ‘go-getter’, with genuine faith in the Bijlmer community. The shopkeepers at Kraaiennest have been through some difficult times, largely due to the disappearing of community centres and the demolition of blocks of flats in the area around the shopping centre. Mohammed, chairman of the Kraaiennest merchants association, and other entrepreneurs joined forces in an attempt to re-establish Kraaiennest as a vibrant and attractive alternative for the people from the surrounding area. Although Mr Ali Reza Ózcan doesn’t live in Amsterdam Zuidoost, he enjoys being an entrepreneur in the Bijlmer district. 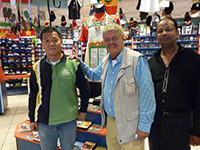 Since 2001 he owns a clothing repair shop and dry cleaners’ in the Amsterdamse Poort Shopperhal. In January 2010 he opened up a second store where he sells curtains, blinds and all sorts of accessories. The fabrics are imported from various countries, but mainly from Ózcan’s native country Turkey. Ali Reza made the deliberate choice to do business in the Bijlmer, because of its cultural diversity and the potential of shopping centre Amsterdamse Poort. His clientele are people from many different cultural backgrounds. He is delighted to see that the products from his native country are being appreciated by so many people. Grecia Josefina has been living joyfully in the Bijlmer for years. After her employer went bankrupt, Grecia had only one thing on her mind: starting her own business. She decided to follow up on her dream and started a small company selling party accessories, balloon decorations and piñata’s. Now she is the proud owner of Eye 4 Parties, a shop for party attributes located in shopping centre Kraaiennest. Apart from accessories and decorations she also offers cultural specialities. Even people from outside Amsterdam know they have to go to Eye 4 Parties for the best piñata’s. Ever since Mr Henk With, owner of Ghabiang Travel, finished his study in economics he had a huge drive to become an entrepreneur. Not only for himself to be able to do business, but also to set an example for others. Mr With thinks it is very important that the Creole people from Surinam are represented in the entrepreneur network. He also sets great value on making a contribution to society and to the Bijlmer community by offering internships to students. Mr With has great plans for his travel agency Ghabiang Travel. He gradually wants to shift the focus of his business to ecotourism, to promote the ecological beauty and riches of Surinam, a hidden treasure to most people. But that’s something Mr Henk With is about to change. After eight years as a professional triathlete, Marc Koks thought it was time for a new challenge. Then the West-Frisian heard through the grapevine that a bike shop was for sale in the Bijlmer. In 2003 Marc took over the shop and became an entrepreneur in the Bijlmer. Growing tired of the long commute between his home in West-Friesland and Amsterdam Zuidoost, he took up residence in the Bijlmer two years ago. 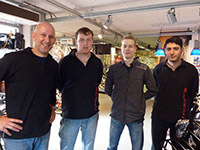 Marc’s Bike Shop is situated close to train and subway station Amsterdam Bijlmer. The business has been continually growing and the shop is now supported by a solid team serving the Bijlmer community. Problems with your bike? Take it to Marc’s Bike shop. Mustafa moved from Turkey to Holland in 1979. He started out doing all kinds of jobs, until in 1982 he started working at the Hubo hardware store in Kraaiennest. About four years ago it went bankrupt because of a lack of costumers in the semi-enclosed shopping mall. Mustafa went back to Turkey for a while, partly because of family reasons. But he returned to Holland again, with one thing on his mind: starting up his own hardware store in the Bijlmer. Mustafa went back to the place where he had worked for so many years to realise his dream. Many old customers immediately recognized Handy Mustafa, who had always been the man for the job in their eyes. Mustafa kept in touch with the agent of the mall and finally got the opportunity to open up his store in a former barbershop. Two years ago, Mustafa moved back to the former Hubo premises, this time with his own shop, Muskon IJzerwaren. Many of the products you can buy from Mustafa aren’t for sale in the nearby Praxis. In two years a new mall will be opened, and Mustafa has already been asked to set up a new shop there. Hedwig Parden and Anke Luth were Mr and Miss Bodybuilding Europe in 2005. Hedwig also has a world championship to his name. Sports and people are their life passions. It was their dream to own their own sports shop. When the opportunity arose in 2008 to open up a gym in a former supermarket in shopping center Kraaiennest, they took it with both hands. Their fitness centre is a real family business, as several family members are helping out in the gym. Professional Fitness does not only contribute to the attractiveness of Kraaiennest shoping centre, it also adds to the social development of the neighborhood, providing positions and internships for trainees. Professional Fitness is an official training company of the ROC. 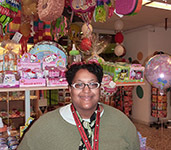 Mavis Hofwijks has been an independent businesswoman for 15 years. This swimming instructor from Surinam moved to the Bijlmer years ago and is well-known and respected in Amsterdam Zuidoost. In her former home in the Fresh Stein apartment building she started out cooking for other people. Her kitchen soon became too small but Mavis was unstoppable. After a while she became the first entrepreneur in the rebuilt Hakfort-garages. Mavis is the inventor of the now famous rotirol (see photo). Her viadoe’s cake is known as far as America. Prince Willem Alexander complimented her on her cooking and the former town mayor, Job Cohen, is a well known customer of hers. She doesn’t want to retire, although she’d certainly deserve some restful years. But Mavis is too eager to transfer her cooking skills and knowledge to younger generations. For everyone who wants to retrieve memories of the taste of that original real Suriname sandwich, George Tjons bakery is the place to be. In 1983 George came to Holland because of the political situation in Surinam, where he earned his money as an independent baker. In the Netherlands he had to renew his diploma’s to be able to become an independent baker again. In the meantime he worked in a bakery as an employee. After getting his diploma’s he set out to achieve his goal: his own bakery. But George had trouble finding a bank that would finance his company, so he worked really hard and saved money. Ultimately his hard work was rewarded, and one and a half years ago George opened up his own bakery in the Hakfort-garages in the Bijlmer district. George bakes bread for Surinam companies, he does catering and of course you can buy bread in his bakery. Almost everyone in Zuidoost knows the sandwich shop of Mr Tjin, offering every typical Surinam dish. Before opening up his sandwich shop in Amsterdam Zuidoost, Tjin and his brother owned a record shop in the Kinkerstraat, where customers regularly hung around until way past closing time. Often they would jokingly ask it they could be served a sandwich and a drink. When the record business slowed down, they almost automatically switched to running a sandwich shop. Mr Chin’s brother remained in the sandwich shop in the city centre, Mr Chin himself started up a new business in Amsterdam Zuidoost. Although he didn’t live in the Bijlmer district, he expected it to be a good area for a business. 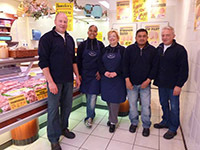 Since 1994 his sandwich shop is located in shopping centre Amsterdamse Poort. 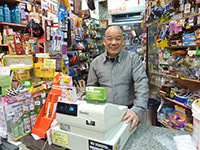 Mr Chin runs the shop with a solid, enthusiastic team, including his two sons. Ramon took over the Toko Kai Hing from his father eight years ago. In 1975, Toko Kai Hing was the first shop in Ganzenhoef to open its doors. Nowadays Toko Kai Hing is an established name in shopping mall Ganzenhoef. You can buy almost everything there, food, vegetables, a sandwich or a meal, but also your favourite fragrance, household appliances, garden utensils and kitchen tools. Toko Kai Hing is THE neighbourhood shop. It is just the right place for small groceries, but also for perfumes, kitchen and home appliances and even some medicinal health products. Nico has worked in the Bijlmer since 1989. He started off as an employee in one of the shops in the Shopperhal, but since 2000 he is the proud owner of his own butcher’s shop: Nico’s Slagerij. Nico feels right at home in the Bijlmer. He has a great feeling for the neighbourhood and its people and loves its diversity. 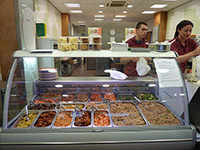 Being an entrepreneur in a multicultural centre, he added foreign specialities to his usual Dutch range of products, like for example Surinam meat dishes. Since 2008 the Bijlmer boasts a Turkish restaurant on the Bijlmerdreef, owned by entrepreneur Öztürk Erkmen and his uncle. The choice for the Bijlmer was an easy one. Öztürk Erkmen knows Zuidoost very well, as he was born in the Bijlmermeer high rise flats, he studied there and he is still happily living in the Bijlmer today. On top of that, as an entrepreneur he saw the business potential of the district. The restaurant is by no means visited only by the Turkish community, because there aren’t too many Turkish people living in the Bijlmer. It profits from a very diverse clientele. Meram gets a lot of business from the Bijlmer population and people working in offices around the area. Choosing to start a business in the Bijlmer has been very successful for Öztürk Erkmen. Since the emergence of shopping mall Amsterdamse Poort, the shopping mall in the heart of the Bijlmer, Café ‘t Amsterdamse Poortje has been an established name. In this cosy cafe – called ‘het Poortje’ among regulars – you can get a cup of coffee or anything else for that matter, expertly and lovingly served up. It boasts a beautiful billiard room and in the weekends there are parties and bingo evenings. 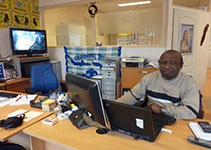 Michel Amatkarijo, who runs ‘het Poortje’, grew up in the Bijlmer. The first sixteen years of his working life were spent in the ICT business. In his spare time he worked behind the bar of Café ‘t Amsterdamse Poortje, enjoying the contact with the customers. With a large group of regulars, ‘het Poortje’ is a very popular destination in shopping mall Amsterdamse Poort. Kees Kuiper always knew that he wanted his own shop. It was his dream ever since he was a little boy. That dream has finally come true. About 36 years ago he started a small business selling music in Grubbehoeve. His former employer, V&D records, didn’t like that idea and so Kees formally started his own business. In Pico Records Kees Kuiper sells music and videos from all continents. If you’re looking for something but you can’t find it, try Pico’s. It also specializes in the Rastafarian culture, selling items such as clothing, music and jewellery, which are imported by a local Gambian entrepreneur, who was able to start his business because of the micro credit financing by Kees and his partner. Kees considers himself a true world citizen with a particular fondness for Surinam, and therefore the Bijlmer the is the place to be for him. If you enter the Amsterdamse Poort from the direction of the Bijlmer train and subway station you automatically pass this tasteful establishment run by Ronald Buijs and Lais Mohammed Khan. The Sweet Store serves up a simple lunch or a sumptuous meal Surinam or oriental style. Meals are prepared in their own kitchen and several Kingma School locations. The Sweet Store is a work training company where Kingma School students with limited opportunities on the job market can gain working experience in the restaurant and bar trade, the retail trade and cleaning. Several schools in Amsterdam participate in this project, predominantly in the Zuidoost district. After their training at Sweet Store, about 60% of the students find employment or start schooling at a higher level.